Happy New Year! The 2010 season doesn't seem that far away now! The most important fact was that it was accessible to me bomber jacket men buy motorcycle riding gear at deep discounted price. Maybe it was that stare that is noticed first on Ruben Amaro’s face on his Phillies baseball card, that sheer look of terror that scared pitchers far and wide… Not! This is from my own collection of Phillies cards and now he’s our GM. A lot of Phillies fans who are younger can’t remember when the current Phillies GM was a player. The fact that Ruben Amaro’s father was a Phillies player before him in the 60’s (1960-65) and then a coach and executive with the Phillies who even won a Gold Glove in 1964 as a member of the Phillies team at shortstop comes to more surprise with some of the younger generation that is just starting to discover some Phillies history. Ruben Amaro Jr. spent two stints with the Phillies, one from 1992-93 and then again from 1996-‘97-‘98. As a member of the Cleveland Indians in 1995, he got a couple at bats in the ALCS, and then a couple at bats in the World Series, he went 0-5 with one strikeout in those two postseason appearances but he was in the game none the less. Brad Lidge was far from perfect in 2009, but as Phillies fans we can never lose sight of the ‘perfect season’ he had in 2008. He was the stopper, the one we counted on to go out there and save the game for us and that’s just what he did. From the first game of the season in ‘08 till the very last game of the regular season, Lidge stayed true to his mission. Lidge had more saves in a season in his career only once, when he saved 42 games for the Astros in 2005. Lidge turned in a perfect season for the Phillies in 2008 though, he went 41 save opportunities and coverted them all to saves, the whole season was perfect for him. It was the first time that a Phillies closer had a perfect season. The ‘save’ by a relief pitcher is a relatively new term in baseball, it’s been around from 1969. It is rare for a team’s closer to have a perfect season. Eric Gagne was perfect in saves for the Dodgers in 2003, he was 55 for 55. Lidge is currently number 40 of all time leaders with saves at 195, he has a long way to go to catch Trevor Hoffman who has an incredible 591 saves to lead all of the majors. Brad Lidge seems like he's been a Phillie for a long time, but in fact he's only been on the team for two full seasons. Brad Lidge came to the Phillies on November 7, 2007 along with Eric Bruntlett from the Houston Astros for Geoff Geary, Michael Bourn, and Mike Costanzo (minors). Michael Bourn has been a good catch for the Astros as he won a Golden Glove for them last year and had 61 stolen bases. The Christmas season always comes and goes faster than ever. It’s Christmas Day 2009 and I want to wish everyone who stops by and have stopped by the blog and our podcast and everyone who we have had on our podcasts a very Merry Christmas and Happy Holiday season! There’s been thousands of downloads of the show both here on the website and via iTunes and many thousands of visits to our page here on the internet this year. 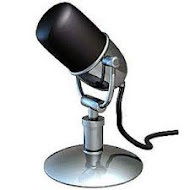 We’re going to be getting better and better for 2010, there is our annual “MLB Picks” show and “Phillies Preview” shows coming up soon and much more to follow here on our blog and the “Phillies Talk” internet radio show also. 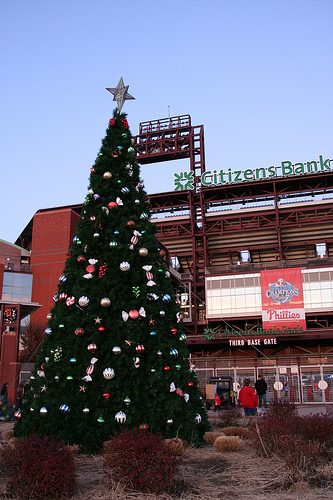 Join us for the holiday special podcast of Phillies Talk – we talk about the recent Roy Halladay pickup, and losing Cliff Lee with the Phillies beat writer, Scott Lauber, from The News Journal in Wilmington. What will become of Ryan Howard in 2011? 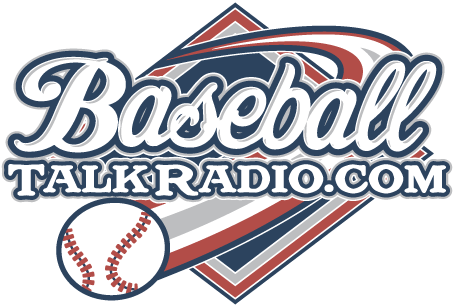 Who may the Phillies get for the bullpen in 2010, all this and more on this special edition of “Phillies Talk” with Rich Baxter, Jim Mulry and special guest, Scott Lauber. Before the Phillies made their blockbuster announcement that they had acquired Roy Halladay, I posted a blog post here that spelled out why Roy Halladay wouldn’t be coming here. It was money which stood in the way and the combination of what the Toronto Blue Jays would want from the Phillies that would make this deal an almost impossible deal to complete. “It would take a super star to make this deal” is what I wrote, and being that Rollins, Utley, and Howard were virtually untouchable, my thoughts never turned to Cliff Lee being that ‘super star’. Cliff Lee brought a very different approach to this team, he brought a zeal to play. A guy who ran out to the mound every inning he pitched, not just strolled out there like a pampered millionaire out there to make it look good. He had all of the ingredients that Philly fans love, a dedication that everyone picked up on and admired. When he took the ball to the mound, we knew what we were getting. The 2009 run to the playoffs and the playoffs themselves was made possible largely on the talents of Cliff Lee. After the Phillies acquired him, there was a calming effect to the starting rotation. Not that Roy Halladay won’t do the same thing, but Lee proved his value to the Phillies again and again this past season. Cliff Lee was 4-0 with a 1.56 ERA in the playoffs and World Series in 2009, there's almost no way to do any better than this. If the Phillies would have traded a Cliff Lee for a Roy Halladay straight up, I would have been happier with this deal. I would have thought more of the whole situation. The fact that the deal went down the way it did leaves some unanswered questions in my mind, and the minds of other Phillies fans that wondered why? Why did we do what we deal off Cliff Lee who had at least one more full season under contract with the Phillies. If he left after next season, the Phillies would have received two top picks in the draft as compensation. I don’t think he would have left the Phillies after 2010 but that is now a moot point. We’re going to talk more about this trade and everything that made it on this week’s edition of the ‘Phillies Talk’ podcast that will post here to this blog on Tuesday night by 9 PM (and also on iTunes) , our special guest will be Scott Lauber, of the Wilmington News Journal, who will help us make sense of this deal and some upcoming deals the Phillies may be making.